In a conference room overlooking bustling Fifth Avenue, several people gather to sit, backs straight and eyes closed, and focus on their breathing. If minds wander, these stray thoughts are acknowledged then released as attention returns to the breath. The idea is to be fully present in the moment, not thinking of the future or the past. It’s one method of mindfulness meditation, an increasingly popular modern movement with roots dating back to ancient Buddhism. A growing body of research suggests that mindfulness practice can treat a gamut of health concerns, including anxiety and addiction and can even train the brain to approach stress in new ways. Practicing the art during the center’s March 19 Mindfulness Fair in the Frick Fine Arts Building (Photo by Emily O’Donnell)These biweekly, drop-in meditation sessions, which last for 30 minutes, are one of many offerings from Pitt’s new Center for Mindfulness and Consciousness Studies, which is housed in the Graduate School of Public Health’s Department of Infectious Diseases and Microbiology. 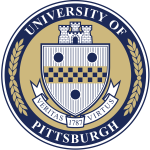 Led by center director Anthony Silvestre, a professor of microbiology, the free sessions attract professors, staff, and students from across the University, as well as the general public. “Mindfulness enhances one’s concentration, reduces stress, and, in general, improves cognitive skills. Research strongly suggests that any intellectual endeavor can improve with mindfulness practice,” says Silvestre. He was ordained as a meditation teacher by the famed Vietnamese Buddhist Zen master Thich Nhat Hanh, whom Martin Luther King Jr. called “an apostle of peace and nonviolence” for his activism during the American war in Vietnam. 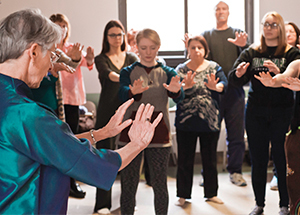 Development of the center began in late 2014 when several faculty members with an interest in mindfulness—including Silvestre—began to share ideas on how to enhance mindfulness on campus, in the Pittsburgh community, and around the world. They wrote a white paper outlining goals, which are to promote the practice and scholarship of mindfulness through three core areas: education, research, and service.